Product prices and availability are accurate as of 2019-04-13 19:31:55 EDT and are subject to change. Any price and availability information displayed on http://www.amazon.com/ at the time of purchase will apply to the purchase of this product. If purchasing or renting from companies other than Pearson, the access codes for the Enhanced Pearson eText may not be included, may be incorrect, or may be previously redeemed. Check with the seller before completing your purchase. 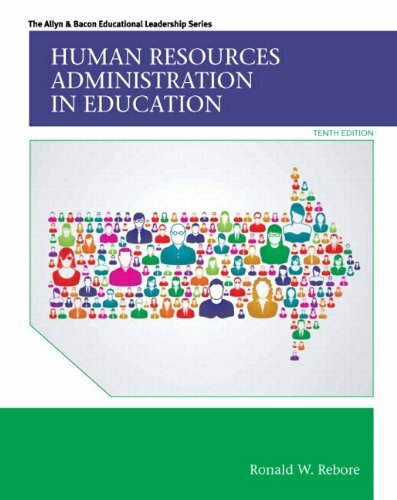 This widely popular text uses a management approach organized around the processes and procedures necessary for implementing effective human resources administration to give students a comprehensive, user-friendly look at the fundamentals. It presents the human resources function within the context of public school districts; covers the eight essential dimensions of the human resources function: human resources planning, recruitment, selection, placement and induction, staff development, performance evaluation, compensation, and collective negotiations; and looks at the legal, ethical, and policy aspects of human resources administration. 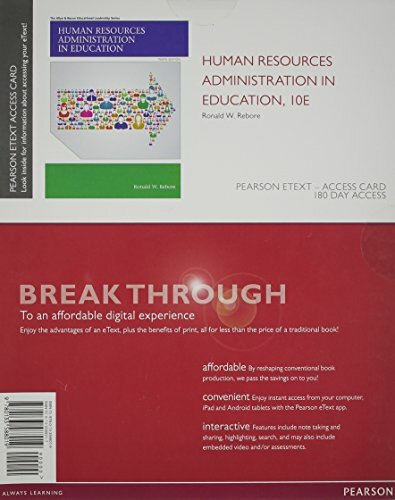 Now available as an affordable e-book, Ronald Rebore’s Human Resources Administration in Education weaves the language of technology throughout; includes more stories and personal examples; poses reflective questions on the focus scenarios; includes a section on value added performance evaluation and more information on win-win collective negotiations; and includes updating throughout. The Enhanced Pearson eText features assessments and internet resources. Engaging. The new interactive, multimedia learning features were developed by the authors and other subject-matter experts to deepen and enrich the learning experience. Affordable. Experience the advantages of the Enhanced Pearson eText for 40-65% less than a print bound book. *The Enhanced eText features are only available in the Pearson eText format. They are not available in third-party eTexts or downloads. *The Pearson eText App is available on Google Play and in the App Store. It requires Android OS 3.1-4, a 7” or 10” tablet, or iPad iOS 5.0 or later.